God is growing our mission! 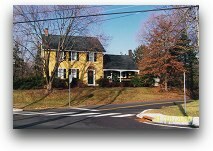 As of September 15, 2008 North Branch will close on the Lawrence House. $360,000+ has been raised towards the $450,000 purchase of the house. And from January 1, 2009 the mission of this house begins! Or should I say, “begins again?” Right about 50 years ago the church briefly owned this house. It was not the parsonage, but it was purchased along with the field that became our parking lot. Along about the time that I was born, the church subdivided the land and sold this house on 3.3 acres to the Lawrence family to finance the parking lot. God had already destined that this place house a vibrant ministry to our community. Fast forward to 2005 and 2006 when the church tried to purchase this without a capital campaign. The Ten Year Facility Planning Committee, chaired by Bob Kiser, looked at buying it with state COAH money; we looked at a ministry that could help us pay it off; but it was not to be. Seeing this as God’s stop sign, the long-range planning committee disbanded. Then last fall I got a call to come to the diner for breakfast. There sat a group of people from our congregation that had raised, at that time, about $350,000 towards the purchase. Quickly we reassembled the Ten Year Facility group. This time, without a large mortgage overhead, God lead us quickly to a ministry born right here in North Branch. Around 2002, long time, and ever visionary, NBRC member Ethel Kienz wanted to fund a new ministry with her estate. So she committed it to the Center for Life Transitions (CLT), brainchild of NBRC elders Tom Bachhuber and Scott Pontier, to reach out spiritually and psychologically to people going through life transitions (marital, career, parenting, aging, etc.). Ethel was an original board member of CLT. CLT and North Branch church will work cooperatively to offer programming and groups to the community as the healing hands of Jesus in our neighborhood. Scott Pontier will move his private practice into the Lawrence House and conduct it in line with CLT’s mission. CLT will provide the church with enough to rent to cover all costs and maintenance. Praise Father, Son and Holy Ghost, Amen.